On Saturday, July 7th, Substation will be bringing the jams back to Ballard with four sets of music by three of the Pacific Northwest’s most popular jam bands. Substation is Seattle’s premiere underground music venue, located at 645 NW 45th Street. 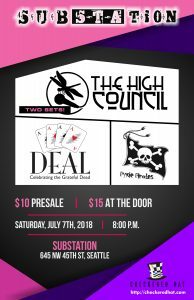 The High Council will be playing two full sets. From the heart of the Evergreen State, The High Council explores the boundaries of melody and groove. With a blend of transcendent improvisation and earthy rock sensibilities, THC draws on elements of jazz, reggae, rock and psychedelia. The High Council members are lead guitarist Zeke Wakefield, rhythm guitarist Ryan Phillapart, bass guitarist Reign King, keyboardist Zack Olson, drummer Davy Nefos and percussionist Jeff Pang. Don’t miss out on this opportunity to journey through the boundaries of music and mind with these three great acts!